Provide comfort for the family of Doris Ray with a meaningful gesture of sympathy. 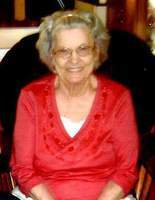 Doris June Ray, 86 passed from this life Thursday, April 11, 2019, at Cookeville Regional Medical Center in Cookeville. She was born Monday, June 6, 1932 in Paris , Arkansas. She was the daughter of the late Louis Raymond and Geneva (Brandon) McGarvey. Doris was a loving Mother, Grandmother, Great Grandmother and Great Great Grandmother. Her hobbies were shopping, music, concerts, travel, and Bingo, She loved spending time with her Grandchildren. Graveside services for Doris June will be held Sunday, April 14.2019 beginning at 1:00 pm at Crest Lawn Memorial Cemetery. Interment will follow in Crest Lawn Memorial Cemetery. To send flowers in memory of Doris June Ray (Alexander), please visit our Heartfelt Sympathies Store.